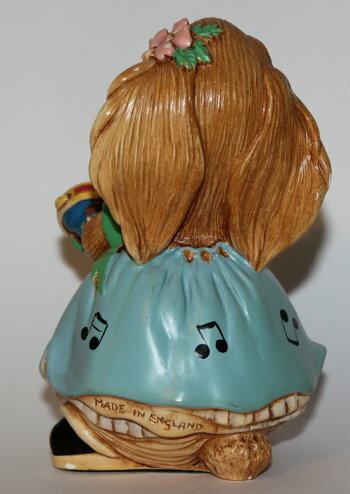 Rare PenDelfin rabbit Rosa wearing a blue skirt designed by Jean Walmsley Heap. 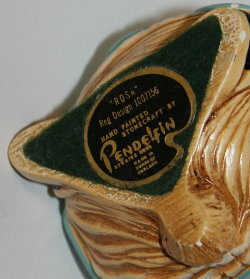 The PenDelfin Rosa rabbit was made with numerous different coloured skirts, from c1982 to 1998, however the PenDelfin Rosa with a blue skirt was only made for around two years from c1982 to 1984. This example of Rosa is wearing a lovely blue coloured skirt with matching ribbons and pink flowers in her hair. On her base this PenDelfin rabbit has her green felt and PenDelfin artist palette Rosa label. Condition: Very good overall condition with only a few nicks and paint flakes. 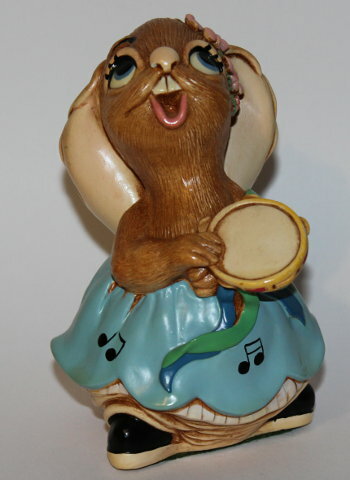 A lovely rare coloured Rosa rabbit perfect for the PenDelfin Bandstand.